This 148-page issue marks the debut of a dazzling new department, “Studio Styles.” Our mission is to celebrate good design in any price range, offer suggestions on how to personalize your studio, and encourage you to live creatively with what you love. In search of design advice we went straight to HGTV’s design star, Genevieve Gorder. See her on the cover and learn more in her article, Master Class on Design. 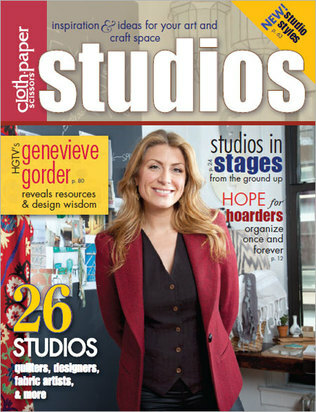 This wonderful, inspirational issue includes a spread on my studio! And yes, it took me three days to clean it in preparation for the photo shoot . . . .